There are tires for sand, snow, mud, and every other type of riding condition, but when the snow gets too deep or the bog too soft, nothing can get you through a tough spot like a good set of tracks. 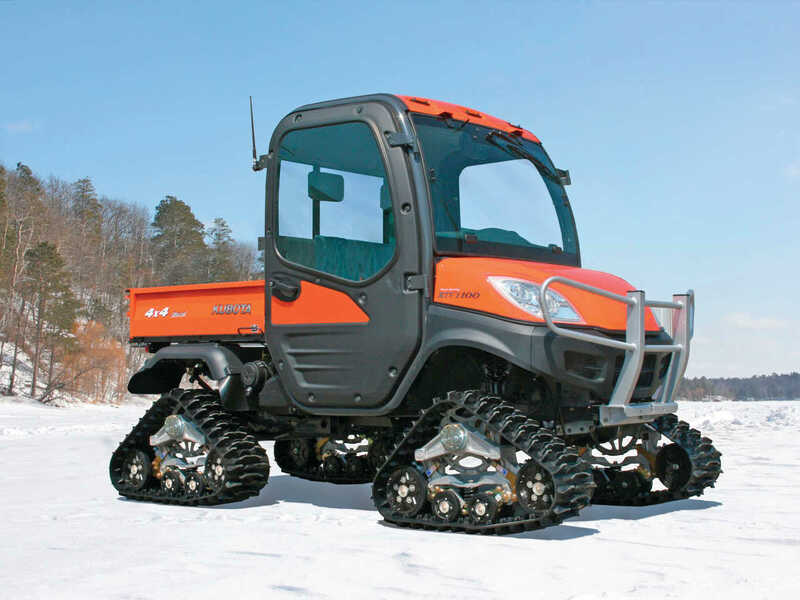 MATTRACKS has been building tracks for everything from tractors to ATVs since 1994 and we’ve tried their track systems on rough, rocky terrain, across a muddy swamp, up hills that would give our relatives cause to worry, and of course, on snow. Their unique, shape changing suspension lets them crawl over uneven or rocky terrain like nothing else, and recently they’ve updated their lineup to cover even more models. The company that has put tracks on every continent began as a drawing and a dream by an 11 year old boy who asked his father if he could build it. The simple rubber track conversion system quickly found acceptance with consumers, and today the company operates from a 160,000 square foot facility in the town of Karlstad, Minnesota. Everything from engineering to manufacturing is contained in-house, and Mattracks is one of the only vehicle track producers in the world that operates their own rubber molding line. They also have a full machining department, assembly lines, and they control the entire manufacturing process so well they even design their own tools and production machinery. What it means is excellent quality control from start to finish. 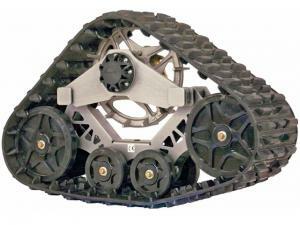 Mattracks calls their ATV and Side x Side track systems the LiteFoot Line. The LiteFoot track system is designed to increase floatation on soft ground or snow while decreasing compaction, and one feature that works extremely well for crawling over uneven or rocky terrain is the shape changing suspension which Mattracks calls SCS. 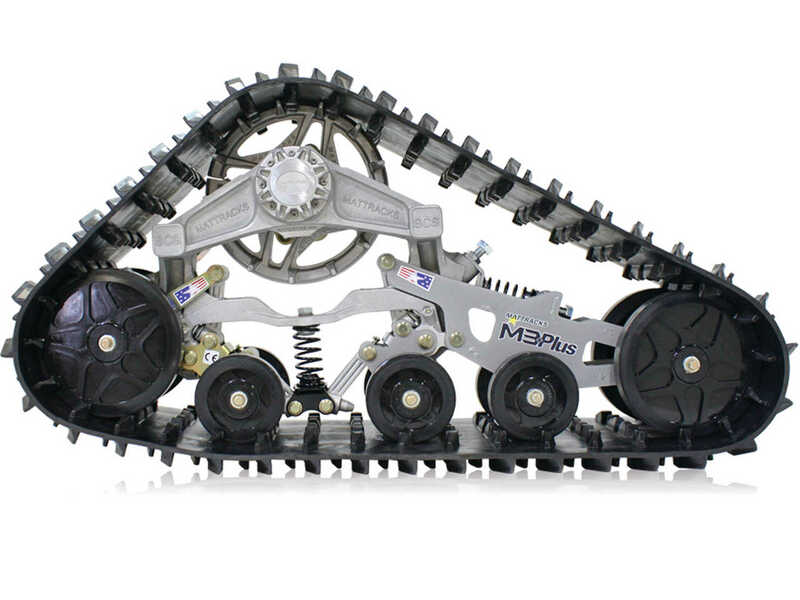 M3 - The "Extra Heavy Duty" version of the utility rated M3 track system. Rated to handle the weight and torque of even the heaviest Side x Sides, the M3 features the most aggressive tread for high flotation and traction in soft terrain. 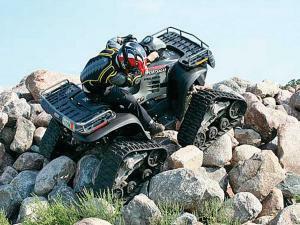 XL - Designed exclusively for ATVs. The LiteFoot XL is the economical alternative to Mattracks’ best riding track system. The LiteFoot XL tracks retain Mattracks’ superior quality, legendary performance and great features. XT - The "Extra Heavy Duty" version of the utility rated XT track system is built for Side x Sides but offers a less aggressive tread pattern and great traction on most terrain. Shorter lugs with wide surface area also allow for easier ride on hard terrain. MATTRACKS realized that some trailers need tracks too and the Trail-R-Mate XT is designed to let the trailer float across any terrain as easily as the tow vehicle. The one piece tracks have internal belting, composite reinforcement, and are made from a specially formulated rubber compound designed to operate over many types of terrain. Track systems designed for Side x Sides are rated for the higher overall vehicle weight as well. Installing the LiteFoot track system is not unlike changing the tires, although it will take you a little longer. Each track drives off the ATV or Side x Side wheel hub, but there are a few brackets you will need to install to keep the tracks from going around like a wheel. Each set comes preassembled, and about all you need to do is jack up your ATV or Side x Side and start bolting it on. If you would rather just pick it up and drive into the woods, your local dealer will be glad to install them for you. 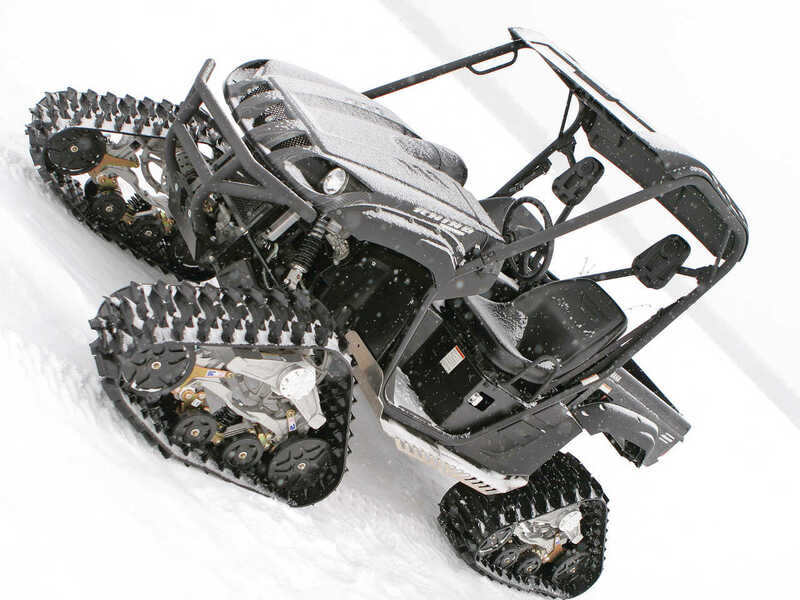 MATTRACKS did make another major engineering breakthrough this year with the creation of their Sprositive Drive system for ATVs and Side x Sides. Because of the front differentials on ATVs and UTVs, the front wheels sometimes turn at different rates which can affect traction and handling. To compensate for this, the Sprositive Drive System has been specially designed to eliminate the gear-like backlash. By eliminating the slack in the front sprockets pitch and changing the pitch ratio in the rear, the Sprositive Drive allows the machine to stay locked in 4WD and helps keep all tracks pulling at the same speed. The Sprositive Drive options are available for Polaris, John Deere, Club Car, Bobcat, Case IH, New Holland and?Cub Cadet UTVs and even some Polaris ATVs. 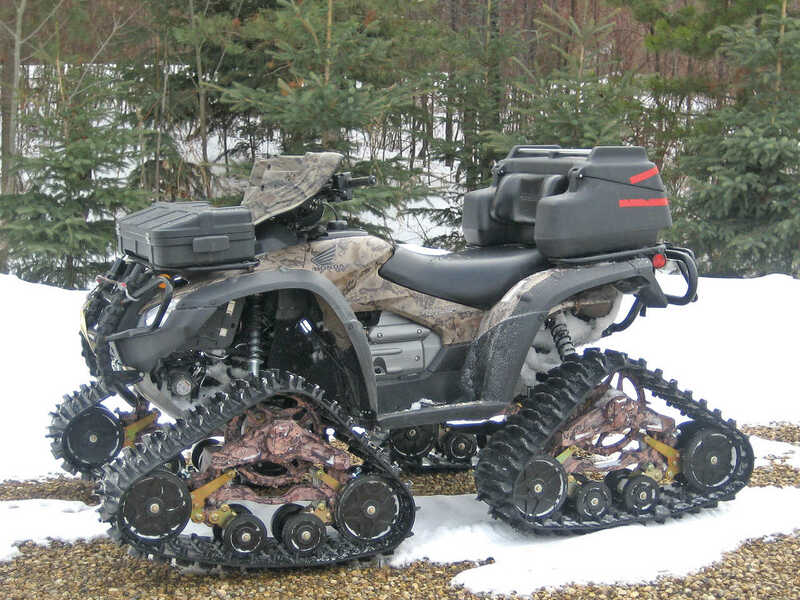 Everybody likes the looks of an ATV or Side x Side with the LiteFoot system installed. It’s like having your own personal tank or ‘dozer and the vehicle sits much higher; you get MUCH more ground clearance. It’s manly! Width is also greatly increased as well, but because of the wider and longer footprint, it feels very stable. We tried the kit on several different machines in mud, on snow, up very steep hills, across boulders, and on sand. The first riding area we tried was deep in Minnesota mining territory with trails that would up, down, and around HUGE piles of iron ore mine tailings. 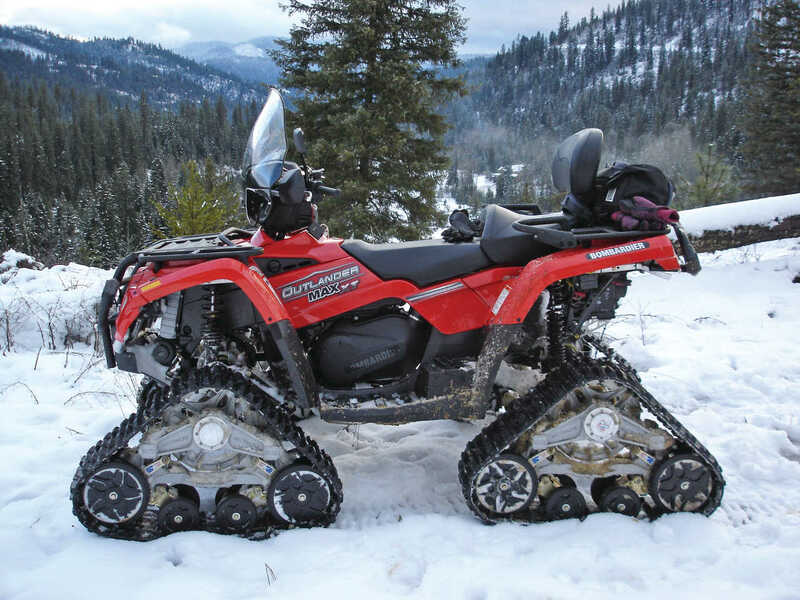 We hopped aboard the Yamaha Grizzly and quickly found the tracks don’t take much power to turn, but they effectively change the gear ratio since the drive “wheels” on each track are a different size than the ATV tire. That means a little less top speed, and you operate a little higher in the RPM range. Mattracks recommends you don’t install the kit on ATVs under 400cc though. The biggest difference between the wheels and the track system is found in steering. The tracks can’t turn as far as a tire can, and winding through very tight trees is not going to happen. Instead you’ll use reverse and make a few 3 point turns, and it will take a little more arm muscle. One Grizzly was equipped with Electronic Power Steering and the required steering effort was about the same as with mud tires. Where the tracks really shine, however, is where regular tires can never go. It was both fun and amazing how much mud and water could be crossed with the LiteFoot track system. Time after time, you could dive into the muddy water and crawl out the other side, both on the Yamaha Grizzly, and on the Arctic Cat Prowler. There seemed to be no limit to how much water we could cross, even with the tracks fully submerged. We next moved to a boulder field. Here we picked our line carefully and crawled over enormous rocks with ease. The shape changing suspension (SCS) works well and allows the track to follow the uneven surfaces, although you want to make sure the leading edge of your tracks climb up and over rocks rather than trying to dig under. 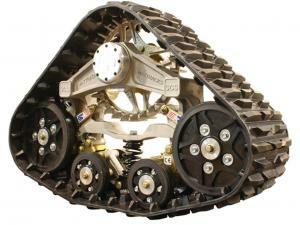 The LiteFoot kits can handle rock crawling when needed, but they absolutely excel where traction is limited. We found our way to the base of enormous and very steep hill climbs of the sort that worry your loved ones. We consider any climb that gets well past the tree tops carefully, and this one was too steep to walk on and covered in loose mine tailings. Seemingly unconcerned and with his medical coverage no doubt fully paid up, one intrepid Mattracks rep pointed his Grizzly at the heavens and stabbed at the throttle. The LiteFoot kit clawed at the slope like a badger on meth, but the Grizzly continued to climb. At only 40’ from the top, the rider stopped just to show us what the kit could do. He gave us a wave, then from a dead stop he again pegged the throttle and easily crested the top. We were impressed! Later in the year, we were also able to test the LiteFoot kit on another Grizzly and a Yamaha Rhino in snow. Again we were impressed with how it crossed deep snow a wheeled machine would never manage. Rather than cutting through the snow, the tracks easily climbed up on it. It was fun to slide the kit across bare ice and to ride the rolling drifts. One thing that’s very important to farmers and anyone with sensitive or wet terrain is ground pressure. Because each track has a total ground contact surface area many times greater than any tire, ground pressure will be negligible. Your foot will transfer more ground pressure than the LiteFoot kit will. The LiteFoot tracks provide great traction, stability, high flotation and you’ll still be moving long after a traditional set of tires has become hopelessly bogged down. If your duck blind, work site, or cabin is far off the road and inaccessible at times, Mattracks can get you there when nobody else can.